8/6/17: Elections by district in Encinitas? This week the Encinitas City Council is headed back into session after our annual summer recess. Although we haven’t been holding City Council meetings for the last few weeks, when I’m in town my schedule remains almost as busy. 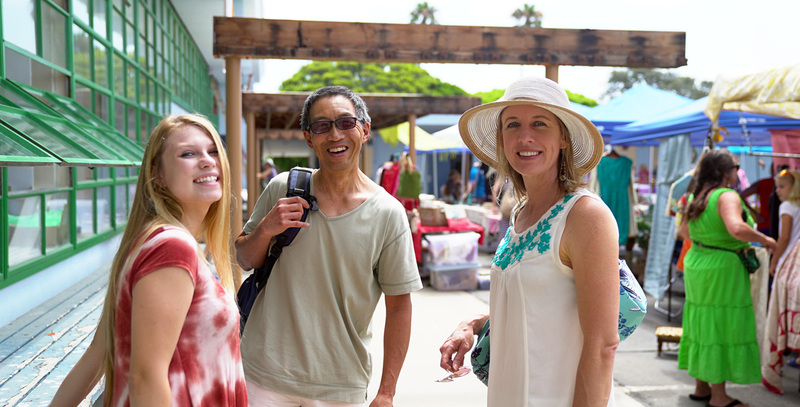 I recently enjoyed the first community Flea Market at Pacific View to raise funds for the art center coming soon to this city-owned former school site. In the top photo by Jonathan Woodward I’m chatting with Environmental Commissioner Jim Wang, (a rare sight since he’s usually taking the photos), and Lizzie Waters, a musician and student at San Dieguito Academy. In the bottom picture, on my right is Arts Commissioner Irene Abraham, and Naimeh Tanha, and on my left is my mother Tricia Smith and Irene de Watteville. 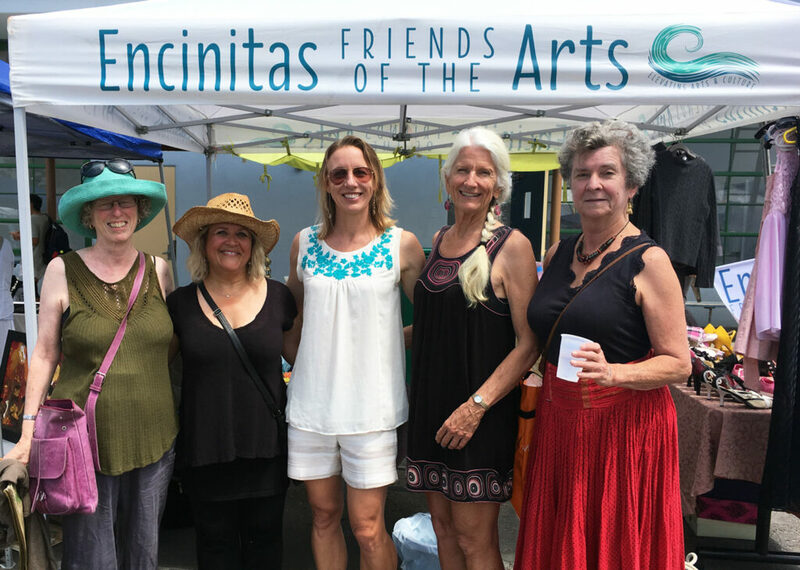 Here’s the bottom line: We’re likely headed to a system where every Encinitas resident will vote for only one city council member, instead of electing all five as we do now. Every resident will live in a district with about 15,500 people in it. The mayor is likely to remain elected by voters in the entire city. About 13 percent, or 8,000, of Encinitas’ 62,000 residents are Latino. Mr. Skenkman alleges that in the city’s 30-year history, no Latino has been elected to the City Council. Many dispute that allegation, citing past elected officials, including Teresa Arballo Barth (2006-2014) and Mary Lou Aspell (1994-1998). Under the current at-large system, every city resident votes for four City Council members and one mayor, with three representatives on the ballot every two years. Mr. Shenkman alleges that the law requires that “communities of interest” be kept together in voting districts, which aims to create more minority representation on elected boards. San Marcos, Oceanside, Poway, Carlsbad and Vista have all recently opted to move to districts in response to this litigation threat. Each of those cities is painfully aware that the city of Palmdale, in Los Angeles County, spent about $7 million fighting and losing a Voting Rights Act lawsuit brought by Mr. Shenkman. Since that time, many cities and school districts have voluntarily switched from at-large to a district system under pressure from Mr. Shenkman’s firm. In addition to the North County cities mentioned above, other cities that have opted to switch to voting districts include San Diego, Chula Vista, El Cajon, Escondido, San Juan Capistrano, Costa Mesa, Buena Park, Garden Grove, Hemet, Wildomar, Hesperia, Upland, and others. In Encinitas, it appears clear that fighting this would not be a prudent use of taxpayer money. And to what end? Additionally, if a city goes to court and loses, the city would lose control of its districting process. For instance, in Palmdale after the city lost the court case, four incumbent Council Members were placed in a single City Council district by the court. In Palmdale, 75 percent of the city is comprised of people of color, but the City Council members were all white with one Latino. In Encinitas, the city likely will be divided into four equally populated parts, or “districts.” It is very unlikely that our five existing communities of Cardiff, Leucadia, Old Encinitas, New Encinitas and Olivenhain will be kept in their own districts. There is a large population size difference between each community, and there are five communities while there will only be four districts. 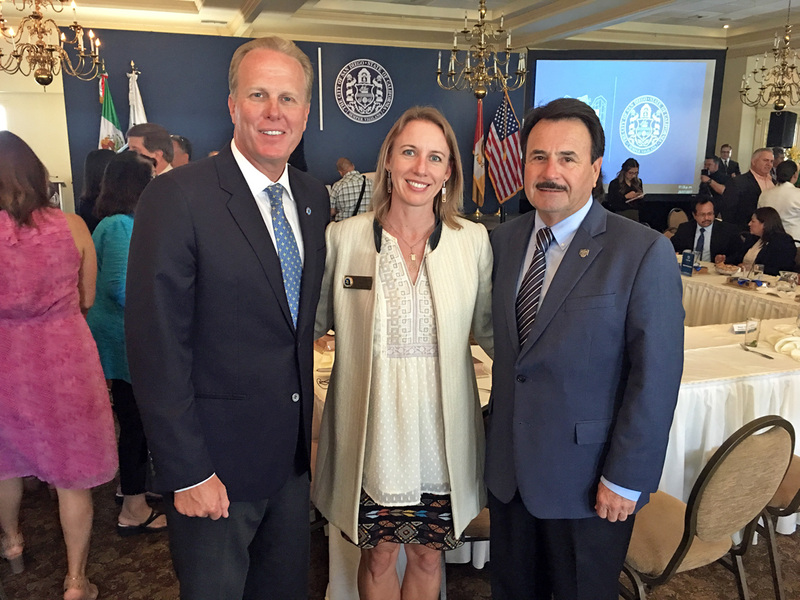 Last week I attended the U.S.-Mexico Border Mayors Association Binational Summit focused on NAFTA and cross-border concerns. The first day’s conference was here in San Diego and the second day we took a bus to Tijuana. We heard information about the joint prosperity that comes from our border relationship, including jobs, housing, culture, and security. Really interesting stuff! Here I’m talking with San Diego Mayor Kevin Falcouner and Tijuana Mayor Juan Manuel Gastelum Buenrostro. Encinitas residents will be very involved in helping us draw the four district maps. It’s likely that the office of mayor will continue to be elected at large and not by district, given that voters specified that in 2014. In drawing the maps, political parties and the addresses of incumbents can’t be factors. Although I don’t believe it makes sense to fight this legal challenge, I am concerned about the effect districting may have on our city. Like other cities, I expect that we’ll grudgingly comply. Our current council members are high-functioning and professional – each is an exemplary public servant. When all of us are elected by the entire community, we are each similarly moved to accomplish the greater good of the entire city. District elections may create a shift toward more provincialism, with council members forced to become competitive, aiming to please a smaller and more specific constituency, possibly at the expense of the whole city. I have no doubt that there are qualified, motivated and appealing candidates in any districts that will be created in Encinitas. However, I believe that structural changes can have impacts on policy outcomes. We’ll all have to wait and see what the effects of districting will be in Encinitas. Here’s the San Diego Union-Tribune story; and here’s the Coast News story. 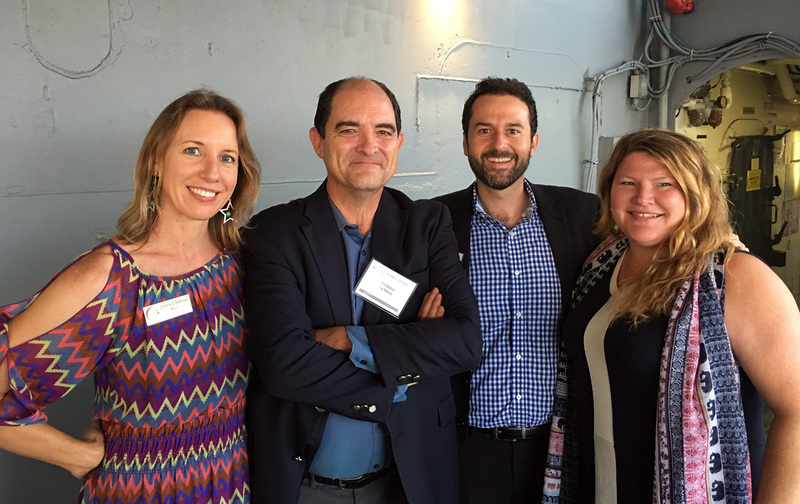 The League of California Cities recently hosted a summer reception aboard the USS Midway Museum in the Fantail Sponson. Left to right: me, La Mesa Council Member Bill Baber, La Mesa Council Member Colin Parent, and Encinitas Council Member Tasha Boerner Horvath. La Mesa and Encinitas happen to share the same city attorney.